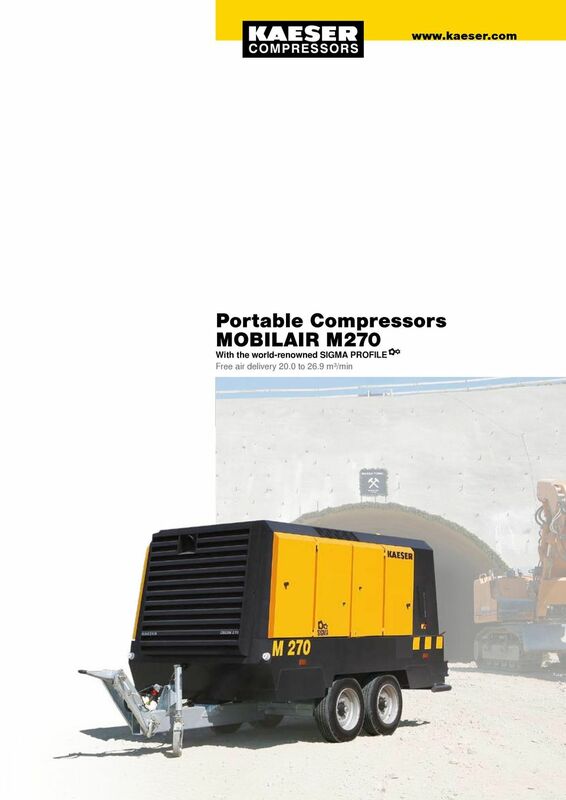 Portable Compressors MOBILAIR M 270 With the world-renowned SIGMA PROFILE Free air delivery 20.0 to 26.9 m³/min. Download "Portable Compressors MOBILAIR M 270 With the world-renowned SIGMA PROFILE Free air delivery 20.0 to 26.9 m³/min. www.kaeser.com"
2 Made in Germany KAESER s renowned MOBILAIR range of portable compressors is manufactured in a state-of-the-art production facility located directly next to the KAESER main plant in Coburg, Northern Bavaria. Equipped with the very latest technology, the recently modernised portable compressor plant boasts TÜV (German Technical Inspection Agency) certified sound testing facilities for free-field sound level measurement, an advanced powder coating installation and highly efficient production logistics. 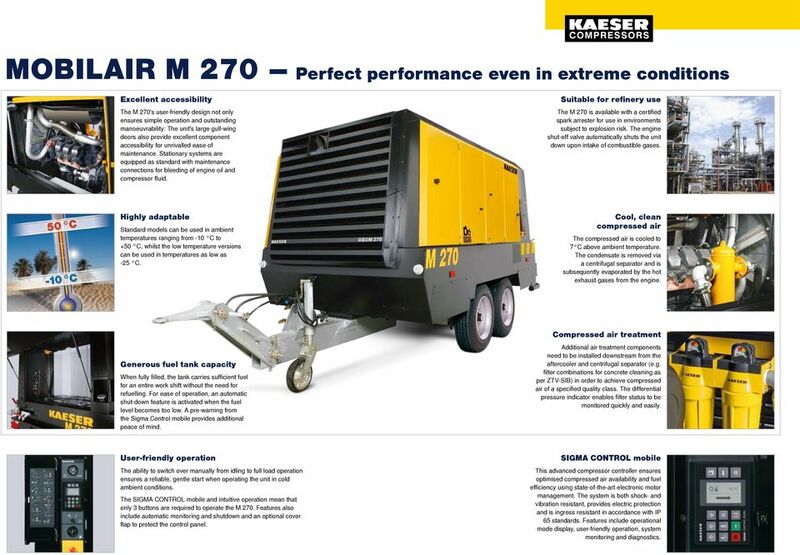 With minimal turn-around time, KAESER s highly qualified personnel are able to assemble portable compressors of all sizes and equipment levels to suit our customers' specific needs. MOBILAIR M 270 Power and efficiency Simple and convenient pressure adjustment Using the arrow keys, system pressure can be precisely adjusted in 0.1 bar increments on the SIGMA CONTROL mobile's display. This simplifies operation and, in combination with the electronic inlet valve control, leads to significant fuel savings especially when operating in partial load. Precision oil temperature control The M 270 s automatically controlled thermostatic valve ensures that optimal operating temperature is reached quickly and reliably. It therefore protects the compressor's fluid circulation loop from excessive condensate accumulation. This in turn significantly extends cooling fluid and separator cartridge service life and also enhances the unit's long-term durability. A powerful team Via the innovative SIGMA CONTROL mobile compressor controller with optional start-stop features, M 270 compressors can be started and controlled by compressed air management systems such as the SIGMA AIR MANAGER. This capability enables full integration into stationary compressed air supply systems (e.g. for back-up in the event of power failure) or the creation of fully power-independent compressor stations (e.g. for large construction sites where there maybe no access to infrastructure, or reserve power). 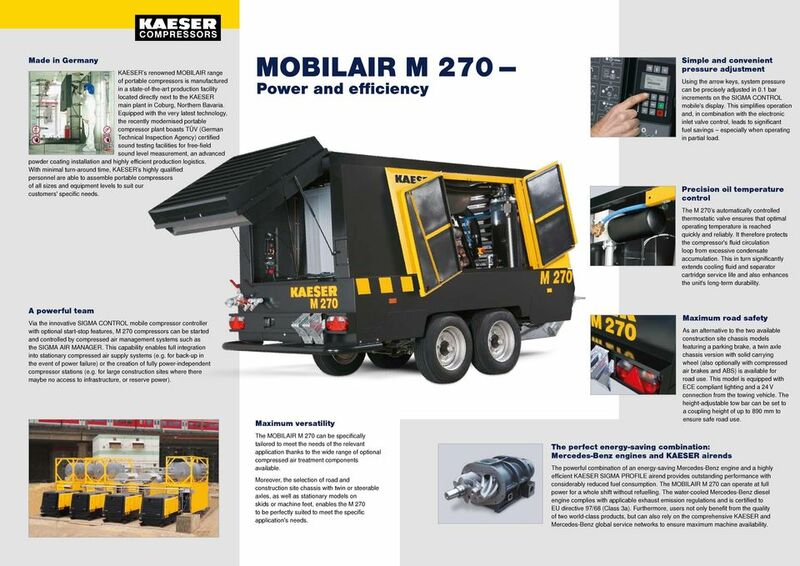 Maximum versatility The MOBILAIR M 270 can be specifically tailored to meet the needs of the relevant application thanks to the wide range of optional compressed air treatment components available. Moreover, the selection of road and construction site chassis with twin or steerable axles, as well as stationary models on skids or machine feet, enables the M 270 to be perfectly suited to meet the specific application's needs. Maximum road safety The perfect energy-saving combination: Mercedes-Benz engines and KAESER airends As an alternative to the two available construction site chassis models featuring a parking brake, a twin axle chassis version with solid carrying wheel (also optionally with compressed air brakes and ABS) is available for road use. This model is equipped with ECE compliant lighting and a 24 V connection from the towing vehicle. The height-adjustable tow bar can be set to a coupling height of up to 890 mm to ensure safe road use. The powerful combination of an energy-saving Mercedes-Benz engine and a highly efficient KAESER SIGMA PROFILE airend provides outstanding performance with considerably reduced fuel consumption. The MOBILAIR M 270 can operate at full power for a whole shift without refuelling. The water-cooled Mercedes-Benz diesel engine complies with applicable exhaust emission regulations and is certified to EU directive 97/68 (Class 3a). 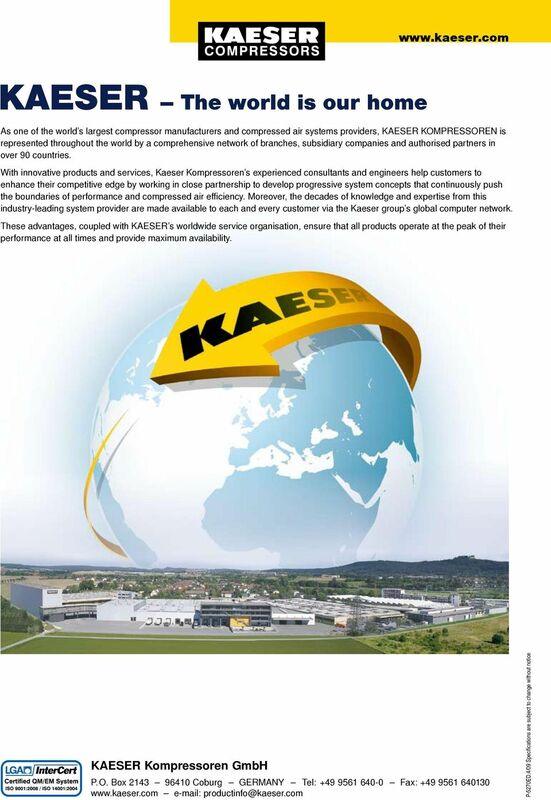 Furthermore, users not only benefit from the quality of two world-class products, but can also rely on the comprehensive KAESER and Mercedes-Benz global service networks to ensure maximum machine availability. 3 MOBILAIR M 270 Excellent accessibility The M 270's user-friendly design not only ensures simple operation and outstanding manoeuvrability: The unit's large gull-wing doors also provide excellent component accessibility for unrivalled ease of maintenance. Stationary systems are equipped as standard with maintenance connections for bleeding of engine oil and compressor fluid. Perfect performance even in extreme conditions Suitable for refinery use The M 270 is available with a certified spark arrester for use in environments subject to explosion risk. The engine shut-off valve automatically shuts the unit down upon intake of combustible gases. 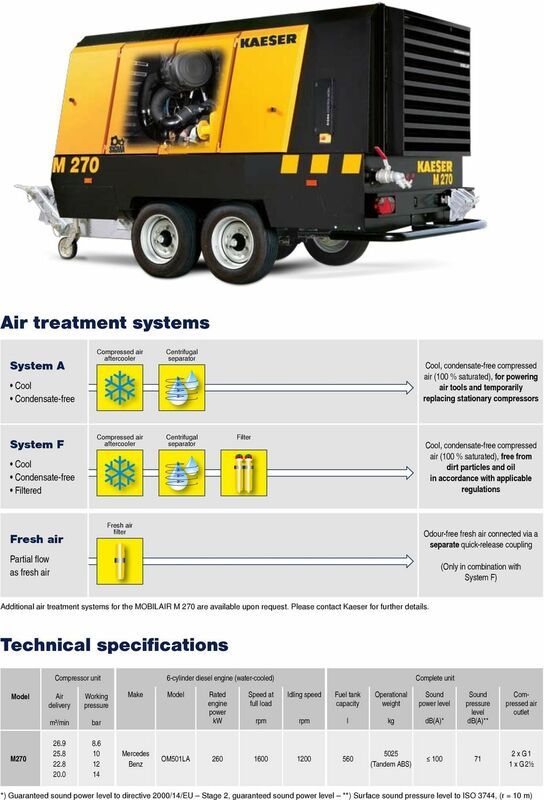 Highly adaptable Standard models can be used in ambient temperatures ranging from -10 C to +50 C, whilst the low temperature versions can be used in temperatures as low as -25 C. Cool, clean compressed air The compressed air is cooled to 7 C above ambient temperature. The condensate is removed via a centrifugal separator and is subsequently evaporated by the hot exhaust gases from the engine. 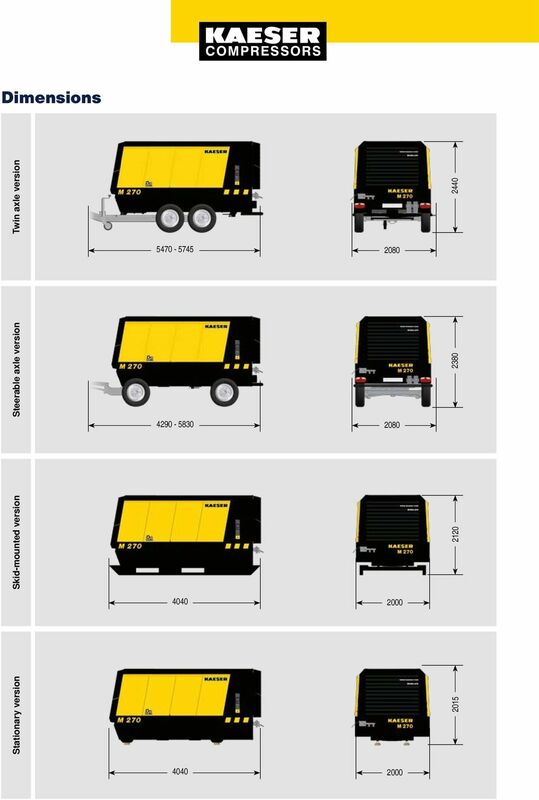 Compressed air treatment Generous fuel tank capacity When fully filled, the tank carries sufficient fuel for an entire work shift without the need for refuelling. For ease of operation, an automatic shut-down feature is activated when the fuel level becomes too low. A pre-warning from the Sigma Control mobile provides additional peace of mind. Additional air treatment components need to be installed downstream from the aftercooler and centrifugal separator (e.g. filter combinations for concrete cleaning as per ZTV-SIB) in order to achieve compressed air of a specified quality class. The differential pressure indicator enables filter status to be monitored quickly and easily. User-friendly operation The ability to switch over manually from idling to full load operation ensures a reliable, gentle start when operating the unit in cold ambient conditions. The SIGMA CONTROL mobile and intuitive operation mean that only 3 buttons are required to operate the M 270. Features also include automatic monitoring and shutdown and an optional cover flap to protect the control panel. SIGMA CONTROL mobile This advanced compressor controller ensures optimised compressed air availability and fuel efficiency using state-of-the-art electronic motor management. The system is both shock- and vibration resistant, provides electric protection and is ingress resistant in accordance with IP 65 standards. Features include operational mode display, user-friendly operation, system monitoring and diagnostics. Automatic Back-Flushing Filter AutoFilt RF9. Quality Control Form (TEST RUNNING RECORD FOR AIR HANDLING UNIT) SUB POWER SUPPLY: MAIN POWER V, Hz, CONTROL V, Blower 1 kw, Blower 2 kw, Compressor: (1) kw (2) kw (3) kw (4) kw Heating Element: kw 1. EASYAIR flat THE COMPACT WAY TO A COMFORTABLE CLIMATE. BRANCH SOLUTION. Automatic fire extinguishing systems for paint spraying plants. Safe for certain.